The year 2016 was characterized by political upheaval across the world, but not in China. Many of the most important China stories reported throughout the year — whether in politics, the economy or society — are about trends that have been forming for several years. We’ve chosen five China news themes that we believe are most representative of the state of the Chinese nation and its relation to the world in 2016. Beneath our top five you can find links to other stories that defined the year, divided into the categories we use in our SupChina daily newsletters. Chinese companies went on a global spending spree, snapping up businesses large and small. Noteworthy deals announced include: ChemChina’s $43 billion offer in February for Swiss biotechnology giant Syngenta; Wanda’s acquisitions of Hollywood production companies and theater chains; Tencent’s $8.6 billion takeover of Finnish computer games company Supercell; Haier’s $5.6 billion purchase of GE’s appliance division; and HNA’s $6 billion acquisition of technology and supply chain service provider Ingram Micro. In a related development, one of the big China stories of 2016 has been capital outflows and the dwindling of China’s foreign exchange reserves, often connected to concern about an economic slowdown. Money poured out unabated through December, contributing by the end of the year to the yuan reaching its lowest levels since 2008, and the government issuing new controls on cross-border capital exchange. By the end of the year, China was no longer the largest holder of U.S. debt: Japan now narrowly holds that title. The result of the U.S. presidential race has almost certainly killed the American-led Trans-Pacific Partnership, a trade deal between 12 Pacific Rim nations that excluded China. Many observers saw this as a boost to China’s geopolitical ambitions. After the election, China wasted no time in pushing its own economic agreements with neighbors, and given the dim outlook for environmental regulation under the Trump administration, China is emerging as perhaps the world’s most promising leader of climate and environmental policy. Trump’s precedent-breaking phone call with Taiwanese president Tsai Ing-wen, and his protectionist leanings, have injected new uncertainty into U.S.-China relations. Some observers interpreted China’s seizure of a U.S. underwater drone in the South China Sea in mid-December as a provocation or test from Beijing for Trump. A long-awaited international tribunal case, titled Philippines v. China, was ruled in favor of the Philippines on July 12. The decision said that China does not have historic rights over most of the South China Sea; Beijing called the ruling “null and void.” The issue took an unexpected turn when Rodrigo Duterte, the new Philippine president who took office on June 30, reversed his country’s course and cozied up to China, going to extraordinary lengths to court China’s favor and turning his back on the long-held alliance with the U.S. His efforts to sign trade deals and soothe territorial tensions with China were welcomed in Beijing. Following the Philippines’ shift, other countries like Vietnam, Malaysia and Thailand all reconsidered their relations with China, and Malaysia in particular followed through on warming bilateral relations. In 2016, there were fewer sniggers about China’s ability to innovate. The country successfully launched a new manned spacecraft in preparation for missions to the Moon and Mars in the coming decades, and built the world’s largest radio telescope. In medicine, China approved the world’s first vaccine for the human papilloma virus (HPV), made striking innovations in human gene editing, and successfully transplanted artificial blood vessels created with a 3D printer into monkeys. From January 1, 2016, all Chinese couples were allowed to have two children, ending China’s one-child policy more than 35 years after it came into effect. Though birth rates in 2016 increased, it is unclear how much — if any — effect the new policy has had, and many critics believe that the loosening of restrictions does not go far enough and that all reproductive restrictions should end. The year 2016 saw a property boom, or a bubble, depending on whom you ask. China aimed to shutter 1,000 coal mines over the course of the year, and ended up halting production at nearly 300. Uber sold its China business to Didi Chuxing. Facebook CEO Mark Zuckerberg made nice with Chinese propaganda chief Liu Yunshan, and his company reportedly began developing custom censorship tools for the Chinese government. The Chinese yuan became an official reserve currency of the International Monetary Fund (IMF). President Xi’s signature political effort, a sweeping anti-corruption campaign now in its third year, began to attract more attention as a drag on the economy. China hosted the G20 summit in Hangzhou, highlighting the country’s work to become a world economic and political leader. The National People’s Congress approved a new five-year plan, with ambitious targets for growth and the reform of state-owned enterprises. Samsung’s late recall of its Galaxy Note 7 in China met with outrage from the public. President Xi Jinping assumed the title of “core” leader on October 27. It is a marker of “almost absolute authority” last held by Deng Xiaoping and Mao Zedong. The first indications that Xi’s status was set to rise to this level came in January. The Cyberspace Administration of China (CAC) deleted the popular microblog account of property tycoon Ren Zhiqiang in February after he posted statements questioning the party’s tightening leash on state media. China passed measures in November to solidify control over the internet. At the third World Internet Conference in Wuzhen, which brought leaders in technology and politics from all over the world, the Cyberspace Administration of China pushed its vision of “internet sovereignty.” The concept was promoted again in a strategy report released by CAC in December. China barred two pro-independence politicians from taking office in Hong Kong’s legislative council, triggering a wave of anti-Beijing protests in Hong Kong. The move was another sign of Beijing’s increasingly tight control over the Special Administrative Region, which was promised a high degree of autonomy when it returned to Chinese control in 1997. In late 2015, five men who had published and distributed books critical of Chinese government officials disappeared. The booksellers turned up in the custody of Chinese police. Economic troubles early in the year led to unusually large and frequent labor strikes. State media reported on corruption among 45 officials in Liaoning Province who had bought their delegate positions to the National People’s Congress. China passed a new law to regulate over 7,000 foreign NGOs, putting them under the direct authority of the Ministry of Public Security. Organizations in politically sensitive areas, like workers’ rights and religious freedoms, were particularly targeted. Protests in Wukan, a small fishing outpost near Hong Kong nicknamed “democracy village” in 2011, turned violent and were quickly subdued by a thousand-strong police force wielding tear gas and rubber bullets. According to defense industry analysts, China is set to double its military spending to $233 billion in 2020, up from $123 billion in 2010. The death in police custody in May of a 29-year-old Beijing resident and environmentalist named Lei Yang caused an outrage online. In December, news that the five police officers involved in his arrest would not stand trial for his death reignited the controversy. The number of people making and watching live-streaming videos in China reached 325 million in June. Laws prohibiting domestic violence came into effect on March 1. The prohibitions, which cover both psychological and physical abuse, mark a big step in a country that has long treated such issues as private matters to be resolved within the household. Chinese state media reported that flooding in 2016 was the most severe since 1998. Other natural disasters also appear to be on the rise. Billed as “the biggest magic kingdom ever,” the $5.5 billion Disneyland in Shanghai opened its gates in June. Claiming the year’s prestigious Hugo Award for best science fiction novelette was Chinese author Hao Jinfang’s Folding Beijing, a story about a dystopian Beijing divided into three physical layers for the elite, middle class and underclass. Chinese actor Wang Baoqiang announced he was divorcing his wife in August after she had an affair with his agent and secretly transferred some of the couple’s joint assets. The topic quickly became a nationwide debate on issues like divorce, the responsibilities of spouses and the public disclosure of private affairs. The gruesome murder-suicide of Yang Gailan, a farmer in rural China, and her four children, all under seven years old, in August sparked a national debate over inequality and the harsh conditions endured by rural families. In an Olympic Games dominated by star athletes and gold-medal performances, Fu Yuanhui broke through by having a really, really fun time, capturing China’s attention and adoration for her goofiness and unchecked reactions. From “skinny blue mushrooms” to “melon-eating masses”, the BBC’s Tessa Wong takes a look at what has captured their imaginations this year. 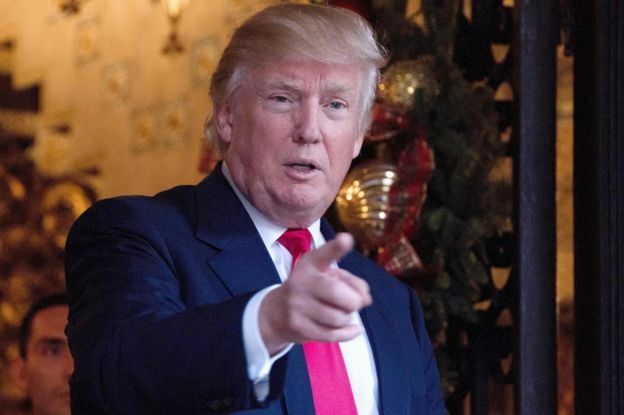 Last year, US President-elect Donald Trump was known as “bed-breaker” – a Chinese homonym for his name. This year, he’s “chuanpu”, one of two spellings of his name commonly used by mainstream media outlets. Some have joked about his connection to Sichuan, whose name shares the same Chinese character. But the weirdest riff of all happened when some speculated that he was actually from the southwest province best known for its pandas and spicy food. The conspiracy theory, spread on social networks Weibo and WeChat, is that Trump was born in 1946 in Sichuan when his father set up a business in China after World War Two. Ink Asia, 2016. Photo courtesy of the fair. For more than two thousand years, ink has been a dominant medium in Chinese painting and calligraphy. It is also a medium widely used in art practices in the Middle East, Southeast Asia, India, Japan, Korea, and beyond. But today’s ink art is no longer confined to works on paper or subject matter indecipherable outside Asia—and collectors are taking notice. Galleries and auction houses in Asia have been actively cultivating an audience for contemporary ink art in recent years. Sotheby’s Hong Kong has staged five dedicated sales in this category since 2013, while rival Christie’s launched a Chinese contemporary ink sale in November 2014. Ink Asia, a young boutique fair in Hong Kong dedicated to the medium, was launched last year and this past week hosted 50 exhibitors, including some top players from the region such as Pearl Lam Galleries, Hanart TZ Gallery, and Alisan Fine Arts. Take, for example, Taiwanese artist Tseng Ting-Yu’s work Dear (2016), which was on view with Taichung’s Da Xiang Art Space at Ink Asia. The video installation depicts a gun made of ink stick being pointed at the temple of a nearby man. Instead of bullets, pitch-black ink shoots from the gun, drips along the contour of the man’s solemn face, and down his bare shoulders. Two ink guns were on display on both sides of the video screen. Gallery director Chung Ching-Hsin said that Tseng’s work is representative of contemporary ink art’s increased focus on concept rather than craftsmanship. “It’s about subverting the traditional form of ink art,” she said. Season Liao, a partner of Guangzhou-based Fei Gallery, said that these contemporary forms of “ink art make this medium easier for audiences who are used to Western aesthetics.” At Ink Asia, the gallery was hosting a solo presentation of young Chinese artist Lin Yusi, whose conceptual fable paintings embodied the traditional gongbi technique. Recent auction sales have demonstrated strong market potential for contemporary ink art. In 2014, the inaugural Christie’s sale of Chinese contemporary ink fetched HK$60 million ($7.7 million). According to the house, this year’s decline to HK$46 million ($5.9 million) across both the spring and autumn sales was attributable to the current macroeconomic environment. Sotheby’s, on the other hand, saw a significant increase in annual total for the category, from HK$25 million ($3.2 million) in 2013 to this year’s HK$73 million ($9.4 million). Don said that for Sotheby’s, growth in sales was brought on by a widening of the collector base for ink works around the globe. “There is an increasing number of collectors from not only China but internationally, with many of them being Asian diaspora,” she said. Established names such as Lui Shou-Kwan, Liu Kuo-Sung, and Liu Dan are among the most sought-after names, and prices for their works have also seen a significant increase. Works by Lui, a key figure of the New Ink movement that took place in Hong Kong, were frequently sold for under HK$100,000 ($13,000) up until recently. But in the past few years, pieces have routinely soared above estimate, with Victoria harbour after rain (1965) selling for HK$4.3 million ($545,997) on an estimate of HK$400,000 – HK$600,000 at Sotheby’s Hong Kong in 2013 and Sketch of Hong Kong – Aberdeen (1963) selling for HK$3.4 million ($438,127) on a HK$300,000 – 400,000 estimate at Christie’s Hong Kong in 2014. Prices for Liu Kuo-Sung’s work have risen even higher. His ink work Scenery of Hong Kong (1987) fetched HK$16.8 million ($2.2 million), above its high estimate of HK$8 million, at a Christie’s Hong Kong sale in 2014, a world record for the Chinese master. 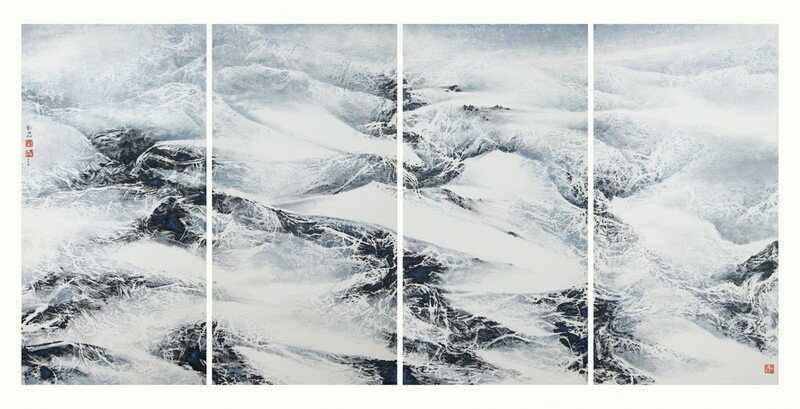 The artist’s Blue Moon Landscape (1969, 1990) was the top lot at the Sotheby’s autumn contemporary ink sale this year, fetching an in-estimate HK$4.9 million ($625,641). Galleries suggest that beyond these significant strides for the category’s market, there is more to be done to expand ink art’s reach outside of Asia. Da Xiang Art Space’s Chung said the 2013 ink art exhibition at the Met in New York helped bringing in a wealth of international collectors. But she, like Christie’s, cited macro forces at play in dampening overall reception. “Prices could have gone up further, but the economy hasn’t been doing well these past two years. And hence prices remain stagnant for these conceptual ink artworks,” she said. Some dealers, like Beijing-based Ink Studio founding director Craig Yee, point to ink’s close relationship to the natural world as an important conceptual juncture for international collectors and curators. But, he further noted, that there remains a need to educate global audiences if they are to truly appreciate this unique art form. Yee said that currently there are not enough curators who have the confidence to articulate the story of ink in the context of history and philosophy. However, there is room for significant change on the horizon. The M+ visual culture museum will prominently feature contemporary ink art when it opens in Hong Kong’s West Kowloon Cultural District in 2019. This is a first but important step in radically changing the way ink art is appreciated.